More examples this week of the real reasons our big public projects, like the Seattle streetcar, often get so off track. Up next is one of the biggest projects ever proposed in the Northwest. Will this one be more honest? Seattle has a checkered history with transportation projects morphing into pricey boondoggles. On one day this past week there were two perfect illustrations why. The first came in the form of a report in this newspaper that city officials last year lowballed the costs of a downtown Seattle streetcar. Nothing new there. Only this time, the costs were lowballed again even after city planners were told they were wrong. “You aren’t changing anything in this operating plan,” a city transit chief rebuked another official, after it had been pointed out the new streetcars would cost 50 percent more to operate than either the public, or the City Council, had been told. Fast forward and the streetcar line in question, along First Avenue, is under construction. So it’s too late to worry about a pesky 50 percent cost overrun! Mission accomplished. This is a classic example of what university researchers have come to call “strategic misrepresentation” — or, as you amateurs might term it, “lying.” It is one of the two main reasons big public infrastructure projects are so often delivered late and way over budget. Simply put, the political system first lowballs the costs and timelines in order to grease the projects for approval. The second reason was on radiant display Friday afternoon up in Vancouver, B.C. Our governor, who I like to call Sunny Jay for his effusive and often contagious enthusiasms, was on full beam when it came to a proposal to build a bullet train from Vancouver to Portland. 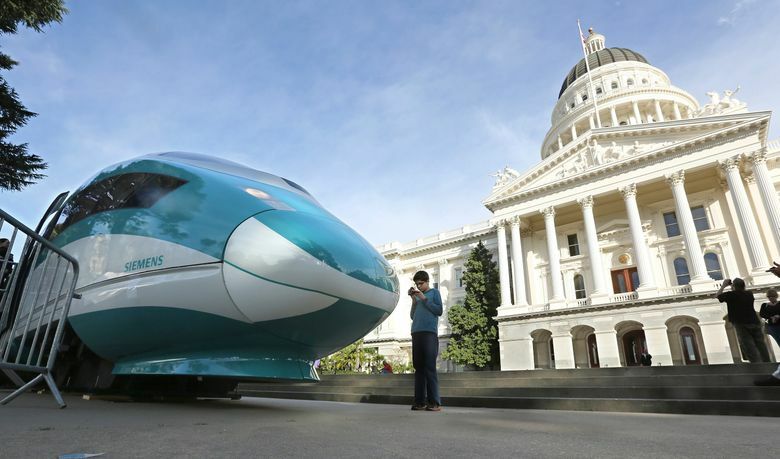 “When you build a high-speed rail line, you are building a monument to optimism,” the governor gushed. He went on to say that the Cascadia region’s unparalleled smarts, innovation and can-do spirit are what’s needed to get a projected 1.8 million riders annually speeding at 200-plus mph across the border. Researchers call this “delusional optimism.” Political leaders want a project to work so badly, and so desire to leave a tangible legacy, that they can’t see even its obvious flaws. At the risk of going all Downer Danny on Sunny Jay (what can I say, it’s what I do best): The ridership he’s touting of 1.8 million per year is very weak. It sounds impressive because it’s got the word “million” in it, but it’s actually fewer people than are carried by some Metro bus routes. It’s less in a year than our short light-rail line carries per month. But the 290-mile bullet train is going to cost $24 billion to $42 billion to get up and running, according to a recent state study of the project. (Inslee was up in Vancouver to announce a second, follow-on study.) That’s five to 10 times what we’ve spent on light rail so far, only it would be for fewer than one-tenth of the riders (another sign that for all the controversy around light rail, it has turned out to be a decent deal). As astronomical as these bullet-train figures are, they’re likely to turn out to be low, given California’s bleak bullet-train experience. A 520-mile line between Los Angeles and San Francisco was approved 10 years ago with a price tag of $33 billion. It has since ballooned to as high as $98 billion, and has yet to be built. Now I love me a transportation boondoggle as much as any card-carrying Seattleite (long live the monorail!). But bullet trains are in a magical thinking category to themselves. I give the governor credit for at least winking at this reality: His calling the train a “monument to optimism” is pretty close to acknowledging it makes no rational sense. Will it be built? Who knows, but as it gets debated, be on guard for more strategic misrepresentation and delusional optimism. Because the other thing we’ve learned in our checkered transportation history is that these strategies, above all else, work. It sure worked to get the streetcar built. Now, some deception and overpromotion is probably the only hope the bullet train’s got.